Introduction: Enterocutaneous fistulas most commonly develop as a postoperative complication of bowel surgery, though in 15% to 20% of cases fistulas occur spontaneously. Management of a patient with enterocutaneous fistula is very difficult. Intraperitoneal surgical repair of these fistulae is very difficult. Coils of intestine are plastered together. Dissection is extremely difficult and time consuming. Local tissue transfer and muscle flaps have been described before. In this case we report a new technique of successful closure of enterocutaneous fistula. Case report: A 44 years old male underwent exploratory laparotomy for small bowel obstruction in 2007. Patient had a significant past surgical history as he underwent exploratory laparotomy for gunshot wound to chest and abdomen 15 years ago. Patient presented now with a complete small bowel obstruction. He underwent exploratory laparotomy with extensive adhesiolysis. Patient recovered well for 2 days. However, later he developed enterocutaneous fistula on day 7. He was managed conservatively with wound protectors initially. His output significantly reduced initially. Later he was diagnosed with jejunal fistula without distal obstruction. Patient discharged home with as he tolerating regular diet. Patient continues to have persistent high output and non healing fistula. He was scheduled for re-exploration after 6 months of conservative management. At exploration his abdomen was plastered with no plane available. At this time we performed a anterior rectus sheath medial rotation and flap closure. Middle segment of anterior rectus sheath was mobilzed and reflected medially. Flap was used to buttress the suture closure of fistula. 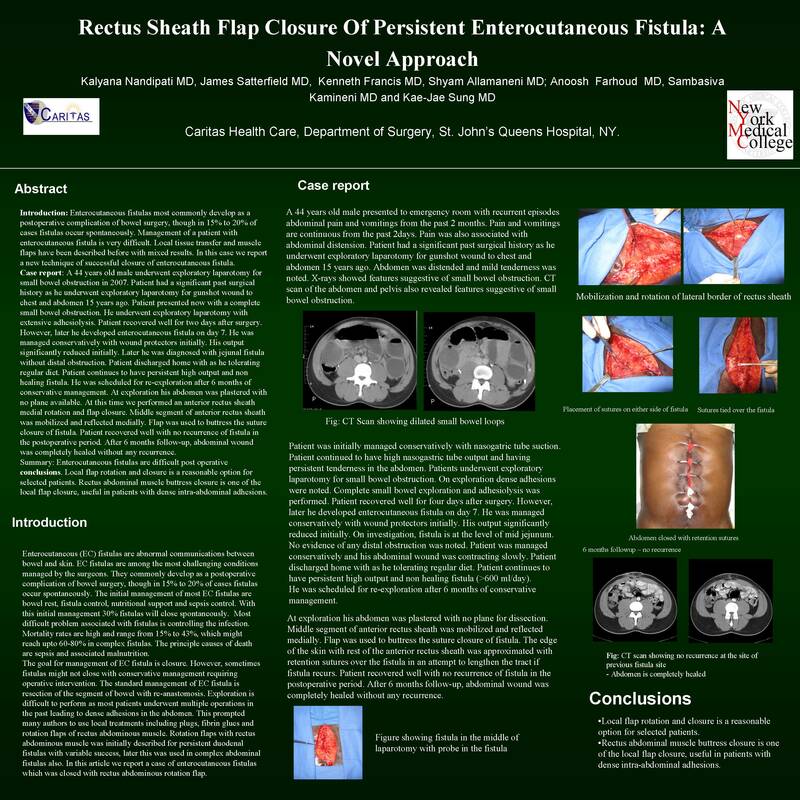 Patient recovered well with no recurrence of fistula in the postoperative period. Summary: Enterocutaneous fistulas are difficult post operative complication. Local flap rotation and closure is a reasonable option for selected patients. Rectus abdominal muscle buttress closure is one of the local flap closure, useful in patients with dense intraabdominal adhesions.